The state of Idaho has fewer roads than you might expect -- many of its treasures remain pristine, unspoiled, and hard to get to, though development is accelerating. There are still lots of well-kept secrets. Hells Canyon, the deepest gorge in North America, was such a place until recently. 7,900 feet from rim to river at its deepest point, as hot as the name implies during summer, and with a vertical drop in the waterway of nearly 9 feet per mile, it was relatively untraveled until the 20th century. Road access is still limited, but the secret is out and the Hells Canyon National Recreation Area has become popular with rafters, swimmers, and anglers. Craters of the Moon National Monument feels like it ought to be kept a secret by government agencies more insidious than the National Park Service. The seemingly alien landscape is actually the work of intense, recent volcanic activity, two to fifteen thousand years ago. Only one paved road across the northern end connects the Craters' freakish collection of lava tubes, lava bombs, pahoehoe and aa flows, splatter cones, and more to civilization. The secret was out a long time ago for the huge ski resort of Sun Valley, one of the oldest in the American west. Since opening in 1936, Sun Valley has positioned itself as the American Shangri-la, attracting Hollywood royalty with its upscale trappings and magnificent slopes. There are few cities in Idaho, a state whose million-plus population is 42% rural. 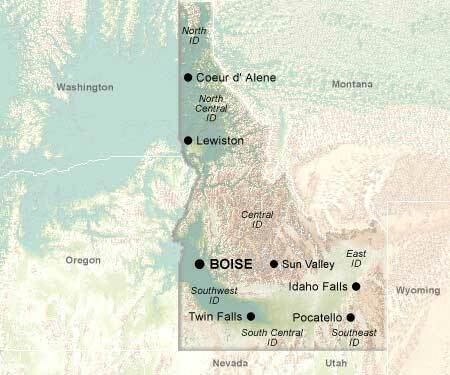 The largest is the capital of Boise, at 125,000 residents. In prior decades, Boise's economy revolved around agricultural products and their processing and distribution, but in recent years semiconductors, computer hardware, and electronics have become major industries. Those who know Idaho primarily as the "potato state" are sometimes surprised to hear about this explosion of the high-tech sector, but like many other things about Idaho, in time Boise's technological savvy will become common knowledge.